After 40 years of perfecting flash-over-substance theatrical rock, it’s hard to imagine anyone going to a Kiss concert these days not knowing what to expect. Give Gene Simmons, Paul Stanley and those other two guys credit, they have dutifully carried on as shock rockers long after their rock has had any real ability to shock. But calling them relics is a little churlish, and probably beside the point given the rousing reception they received Friday night at the Saddledome. Like a midnight showing of Rocky Horror Picture Show, a Kiss concert is about exacting, well-rehearsed consistency and familiar spectacle. This is not to say the boys didn’t occasionally show their age. Stanley even joked they have been coming to Calgary far longer than some audience members “have been around.” Opening with the somewhat stiff rocker Psycho Circus, his voice initially seemed shockingly thin and off-key, not that vocal prowess was ever really his strong suit. But it wasn’t until Simmons stepped up for a charging run through 1982’s I Love it Loud, still one of the more tuneful of their hits, that the pieces seemed to click into place. 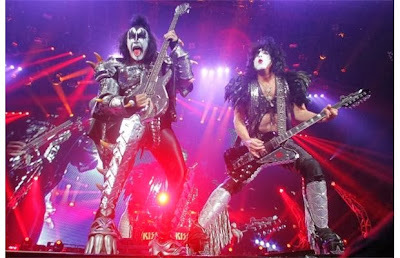 “Nothing is going to keep Kiss and rock and roll from Calgary,” Stanley yowled during the first of many hoarse, crowd-baiting breaks, referring to the fact the show was initially to be a Stampede concert before the floods intervened. Yes, while the night may have been as choreographed as a Stage West farce, it was hard not to buy into the idea that Gene, Paul and the boys were breaking out their A game just for us. The enthusiasm of a Kiss crowd is just too infectious. They howled their approval when Simmons breathed fire after rumbling through the gloriously dumb anthem War Machine as if they had never seen it before. While the obligatory guitar-and-drum solo bits by Tommy Thayer and Eric Singer, respectively, are likely designed to give Gene and Paul a bit of a rest, the crowd ate it up. And, yes, it’s still pretty cool to see Simmons spit blood after his sludgy and musically pointless bass solo. There’s no need for nuance or breaking new ground. While the crowd politely tolerated the new number, Hell or Hallelujah, they weren’t there for an exploration of deep cuts. It’s a good thing, because Kiss have never been particularly generous when it comes to filling albums with too many good songs. As press time neared, they were charging through their best, most catchy and durable offerings: Lick It Up, Love Gun, the fantastically sleazy Black Diamond and Detroit Rock City. All of which likely wiped opening act Leogun from the audience’s memory. The British power trio are a hairy but devoted bunch who also seemed to spring from another time. They made do with a modest black backdrop and simple lighting. So it’s a testament to their sweaty devotion that they often had the audience looking up from their beers and new T-shirts with mild curiosity. With a Robert Plant yowl and fleet-fingered soloing that went far too long, singer-guitarist Tommy Smith is certainly a rock star in training, albeit one that would probably have been more at home in 1972. Given what followed, that was probably fitting. Nostalgia is a powerful thing.